"I don't guide myself, or our government doesn't guide ourselves, by what Premier McGuinty does, or Prime Minister Harper does, or anyone else in the country does. We're running our own show down here, and we do it as we see fit, and I think we're doing a great job." Some Tory delegates are looking to clean House, literally, if the party rises to power. A resolution on the party's annual convention floor in St. John's this weekend calls for the number of MHAs to be cut by 18 and cabinet by seven. The Exploits District Association submitted the resolution, which states that the size of government in relation to the population is far too large and is a financial burden. The association calls on the party, if elected, to reduce that burden by cutting the number of MHAs to 30 and the cabinet to 12. It's a drastic downsizing from the current 48-member House of Assembly and 19-member cabinet. Danny Williams, who will be officially sworn-in [sic] as party leader this afternoon, hadn't seen the resolution Friday afternoon and wouldn't comment on whether he'd support it. "I would have to say it would be one of my goals, but, at this point, I can't get out in front of it because I'm not far enough along in the plan for the province," Williams said. "We're basically going to look at a whole new plan for government." Take away four, add five. No, we're not talking about that most confusing of things, the province's new elementary school math programming. This is about the new provincial cabinet. On Monday, Premier Grimes dropped the other shoe, and appointed not four, but five new cabinet ministers — even though he mused recently that a smaller cabinet might be a good idea. Cabinet now has 19 members; with 27 Liberals in the House of Assembly and four former cabinet ministers waiting for an election call so they can retire to their pensions, that means there are only four Liberals left in the entire caucus who aren't cabinet material. It is pretty blatant pocket-stuffing, because cabinet ministers, along with everything else, pick up an additional $44,829 in annual salary. A 19-member cabinet costs taxpayers $868,755 in additional annual salaries for ministers, while a 12-member cabinet would cost just $554,952 -- a savings of $313,803. But what you might not think about as often is that the costs involved with new cabinet members aren't just the obvious ones like salary. Each minister has office staff, office equipment and a host of other expenses that, based on past experience with the Grimes administration, will range anywhere from $200,000 to more than $500,0000. And the expenses don't end there. There are also the significant costs of our province's ever-increasing pension payouts for former cabinet ministers and MHAs. We are the electorate that just keeps on paying. The sad thing is, this would have been an opportune time to reduce the size of the cabinet. The fact remains that, quite simply, not every MHA deserves the job or can handle the responsibility of being a government minister. And we can't afford a cabinet with 19 chairs around the table — not that a province this size even needs such a beast. The idea of the cabinet is to have a small group of senior and experienced politicians who handle the most serious policy decisions that a government is supposed to make. It's not simply another place for the entire caucus to meet under a new name, and with larger take-home salaries than most people earn in the province those cabinet members were elected to serve. Premier Grimes said again Tuesday that he is committed to reducing the size of cabinet -- but he won't address it until after the next election. That promise has the ring of a pledge made by a Grade 1 student to do his math homework ... tomorrow. And every parent knows how much faith you can put in that little chestnut. A number of groups have expressed their pleasure with the new cabinet and minister appointments announced by Premier Danny Williams when he was sworn in as the province's ninth premier on Thursday. The Canadian Federation of Independent Business (CFIB) likes the idea of a leaner cabinet as well as the announcement of a business portfolio. Bradley George, Newfoundland and Labrador's spokesperson for CFIB, believes the premier, by reducing the size of the cabinet, has done more than simply follow through on an election promise. "The premier has taken the first step towards controlling government spending," George said. "By having a leaner cabinet, the premier has sent the message that he intends to manage a more cost-effective government." When you were a kid, were you ever a member of a secret club? Remember how, after a few weeks or so, just being a member wasn't enough, and you had to have some sort of title, like president or vice-president? Thank goodness you grew up. There is a small change in the Government of Newfoundland and Labrador today, one so small thatyou probably hardly even noticed it. Bonavista North MHA Harry Harding has become the legislative adviser to Natural Resources Minister Ed Byrne. Now, for those who aren't familiar with the way the provincial government works, after an election, there are a whole bunch of MHAs in the MHA club. A select few — well, sometimes a few, and sometimesmany more than we can afford — get named to the provincial cabinet, where they get extra duties and extra perks, and where, along with their ministerial entourages, they cost the taxpayers as much as $500,000 per year, per minister. Others get named as Parliamentary assistants; they don't get as much extra money as cabinet ministersdo, but their particular top-ups do cost taxpayers close to $24,000 a year in additional salary. Still others work for committees where they get interesting per diems. When Danny Williams became premier, he vowed to cut the size of cabinet, and he did. Nineteen cabinet ministers in the last Liberal administration became just 14 under Williams. Williams also appointed five of his backbenchers as Parliamentary assistants, a move that costs the taxpayers an additional $125,000 a year. Now, only a few months in, and Williams hasappointed his first legislative assistant. The last time the province had this particular type of assistance was in 1999, when the same title was bestowed on Jim Walsh by Brian Tobin. No one's nose should be out of joint because they are just a backbencher, being an MHA is an honourable position — one you would think incumbents would be proud to hold. MHAs are the building-blocks of the House, and their votes on policy count just as much as anyone else's. It is already an esteemed and privileged club, one that doesn't need more high potentates or official chief bottle-washers. And too many "special" positions are bound to leave a bad taste in voters' mouths. Oh, Tracy Barron, Bradley George... where are youse now? Focus instead on the line in the Progressive Conservative campaign platform that promised to "implement the recommendations of the task force on the not-for-profit sector." Actually, it said continue to implement. Odd that there is no public record of such a task force anywhere. Now that a cabinet office has been created based on it, where's the report? [Williams] said Grimes broke his longstanding promise to reduce the size of his cabinet, which Williams sees as further evidence of continued strife within the Liberal party. "This (party) has now lost nine senior ministers over the last two years: Brian Tobin, Beaton Tulk, Paul Dicks, Chuck Furey, John Efford, Lloyd Matthews, Sandra Kelly, Ernie McLean and Kevin Aylward. That's a significant amount of experience that has not been replaced in the Liberal caucus," Williams said. "These nine resignations provided Roger with ample opportunity to reduce his cabinet but he has been unable to do so because of internal problems. Numerous members threatened to resign or not run again if they weren't appointed to cabinet. The premier had no choice but to hold cabinet positions as political plums for his entire caucus." Mr. Speaker, the Throne Speech reduced the size of Cabinet to no more than one-third of the number of electoral districts, which would allow for sixteen Cabinet ministers including the Premier; yet, a brief glance at members opposite shows eighteen Cabinet ministers plus the Premier. In fact, almost every member opposite who plans to run again, currently has a Cabinet portfolio. My question for the Premier is: If he is sincere about reducing the size of his Cabinet, why didn’t he take the opportunity to lead by example and implement that principle when he recently shuffled his Cabinet? Shouldn’t the Premier practice what he preaches? Opposition Leader Danny Williams said Thursday Grimes should have led by example and reduced the cabinet in his recent shuffle. Williams said he'd cut cabinet, too. "We would certainly reduce cabinet. As to the exact number, that's not something I've really finalized," he said. Williams intends to introduce a "new, leaner" cabinet, but has not decided what its exact size will be. It has taken Danny Williams just four years to inflate his Government Member's Bill to just one ministerial post shy of the Grimes-era record. And it's already as big as the eighteen-member cabinet he once vilified and ridiculed on the floor of the House of Assembly (back in the days when he actually attended) and in the press. And caveat lector: the number of Parliamentary Secretaries for January has arbitrarily set at five. Those posts may have been shuffled around then, and again in April. The Grand Falls-Winsor Advertiser reported on April 12th of this year that Clayton Forsey, in being appointed PC whip, "will take over this position from Conception Bay South MHA Terry French, who assumed the role of parliamentary secretary to the minister of human resources, labour and employment. " Our Dear Premier, who runs The Most Open And Accountable Government In The Galaxy, never bothered to issue a statement on the PS postings at the times they, and their attendant stipends, were shuffled. This corner likes to poke fun at VOCM, and, sometimes — OK, often — poke a little bit more than just fun. But the Ministry of Truth, in addition to having long had a live stream of its broadcast day, has now added on-demand audio of its newsroom pieces to many of its website news scripts. That's a welcome addition to the local media and news universes. Good on VOCM and its web genies for making the leap. Item: province to post $500-million surplus. Question: given that oil money is only as green as any other kind of money, what would the surplus be, but for the revenues that the province receives from the "giveaway" Voisey's Bay project? Further question: where are the loopholes that, famously, you can drive a Mack truck through? Years ago, it was common for the Russians to test defense response by flying near North American air space. Now, people in Labrador are talking about a case this year. 5 Wing Goose Bay union representative Howard Bishop told VOCM Night Line with Linda Swain on August 17th a Russian plane was flying in Labrador airspace without permission. Bishop says by the time the F18s arrived on the scene, the Russian craft was over Goose Bay. Bishop says all this is just another reason government should implement the rapid action battalion at 5 Wing. Happy Valley-Goose Bay Mayor Leo Abbass told VOCM Night Line with Linda Swain had also heard of an incident, but slightly different than that of the union official. Abbass does say the F18s remained in Goose Bay for several days after the incident. He says there are currently 6 of the fighter planes from Baggotville at the base. The Department of National Defence says the F-18 jets that have been at CFB Goose Bay are only there because of repairs underway at their home base of CFB Bagotville, and they will likely soon be returning there. There had been suggestions they were positioned at Goose Bay to be scrambled as Russian aircraft tested North American air space. NORAD spokesperson Captain Steve Neta says the Goose Bay temporary relocation had nothing to do with defence concerns. Neta says the F-18s have not been conducting surveillance on Russian activity. The Canadians have merely been training, the same as they would be doing in Bagotville. Meantime, Transportation Minister John Hickey says the base is a strategic site and should have military assets on a permanent basis. A military official is outright denying a report that a Russian surveillance aircraft, refusing to identify itself, flew into Canadian airspace on August 17th. 5 Wing Goose Bay union representative Howard Bishop told VOCM Night Line this week planes were scrambled from Bagotville to deal with that. NORAD spokesperson Captain Steve Neta denies the story. He says at no time did an aircraft without permission, violate Canadian air space. The Russian Air Force has stepped up activity since President Vladimir Putin's government boosted military funding and revived training exercises. But Neta says there has been no indication of increased bomber flights off Canada's east coast. Neta says the Russians have a right to conduct military exercises, and have done so in international air space, in a very professional way. According to the preliminary figures from Elections Newfoundland and Labrador (.pdf document), 1026 people spoiled their ballots in the late provincial election, and that with the election being deferred or cancelled in two of forty-eight districts. That is the largest number of spoiled ballots since the 1034 recorded in 1982 — another landslide PC win on a wave of jingoist-nationalist rhetoric — and the fourth-highest ever. Well, the fifth, really — there were 1027 spoiled ballots in 1956, but in 2007 there's still one district left for at least two people to spoil their ballots in. In percentage terms, the spoiled ballots were nearly half a percent — 0.47% — of all ballots cast. That's the highest rate since the 0.48% recorded in 1972, and the highest in the post-Smallwood era. The Telegram, where there still are a few quality ink-stained wretches kicking about, probably illegally smoking in their cubicles or some such, still cares, and cares that others care, about facts. Sending in the clowns and announcing a conspiracy — especially against sitting judges who can't answer the insult — is the last refuge of scoundrels. That it is, that it is. "Scoundrels", indeed. The truth is we don’t have much to show for 58 years of Confederation. That is not "the truth." The City of St. John’s has a population of 101,000. It collects approximately $135-million in taxes and several millions more in other, non-tax revenue. It receives $17-million in transfers and grants from the other orders of government. It spends about $165-million on programs, services, and capital expenses. It has approximately 1200 to 1400 direct employees, depending on the time of year. The province of Newfoundland and Labrador has a population of 506,000. It collects approximately $3.8-billion in provincial taxes and other direct provincial revenues. It receives $1.5-billion in federal transfer payments. It spends over $5.2-billion on programs, services, and capital expenses. It has approximately 10,000 direct provincial civil service employees, plus jurisdiction over another 16,000 employees in health and social service institutions, 6,500 in post-secondary education institutions, and over 9,000 teachers and other school board employees, for a total provincial public sector of nearly 42,000 people. In three of the past seven calendar years, and for the past two years consecutively (this year included) St. John’s City Council has held more meetings than the Newfoundland and Labrador House of Assembly has held sittings. In 2005, the House of Assembly out-sat St. John’s City Council by one day, 45 to 44. In 2006, St. John’s out-met the provincial legislature 45 to 40. In 2007, that figure is 35 to 33 in favour of the City. In the past seven years, St. John’s City Council has met a cumulative total of 305 times. The House of Assembly, during the same period, has had 303 daily sittings. City Council will meet all through the fall and early winter. The House of Assembly will not. “This is a very, very good deal that they had, which is a contract that has been in place, basically, since the 1970s,” he said. “Major industries now are prepared to pay at least two cents from what I understand. A half cent is just not in the ballpark. At least, thanks to Blunderdale, we now know the size of the “ballpark”. At least, that’s how big it is for Corner Brook, and how far the Danny Williams government was willing to “roll over” for that area’s “big company”, Kruger. Bob Wakeham, his bio says, "has spent more than 30 years as a journalist in Newfoundland and Labrador". 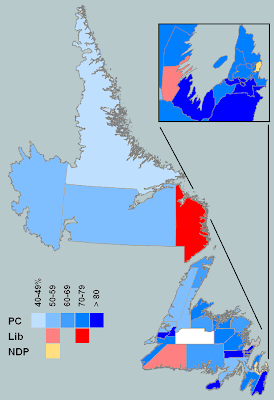 The Liberals then launched a decade-long reign of power (under Wells, his legacy dominated by a national issue, the scuttling of the Meech Lake Accord; then Brian Tobin, the mouth, and the most unabashedly ambitious politician this province has ever seen, Confederation Building a pad to launch himself upalong into politics and business; and then Roger Grimes, the winner of a nasty leadership race who'll always be remembered for manipulating the parliamentary system to stay in power much longer than he had a right to). This corner is no great defender of Roger Grimes, but this is absolute hogwash on Wakeham's part. Under "the parliamentary system", the Premier is the person who has the confidence of the House. In more manageable, real-world terms, that is the person who leads the majority, or at least largest, party caucus. After he won the leadership of his party, that person, the person with "the right" to be in power, was Roger Grimes. End of Chapter One. End of chapter. End of story. * Well, not until the "fixed election date" bill came in, but that's another story altogether. Bill Rowe takes leave from his column. We elected paternalistic types like Joey Smallwood, Don Jamieson and Frank Moores — the kind of politician who would pat you on the head or chuck you under the chin and tell you everything would be all right. We were waiting for the messiah, and there were many false sightings. We trusted Brian Peckford to fight our battles with Ottawa. We hoped Clyde Wells would help us regain our financial footing, and our dignity. We put our faith in Brian Tobin when we needed someone to smooth the way forward. Election campaigns were still old-school — fried chicken, brass bands and baby-kissing. Orchestrated drama and on-cue enthusiasm. Danny Williams’ wild popularity is due, in large part, to the fact that he appeals to our sense of pride and independence, and our determination to see prosperity. He preaches that the solution lies not with him, but with us. Our parents’ politics just don’t cut it anymore. "Our parents' politics", "old-school" election campaigns, "on-cue enthusiasm", "paternalism", and "false sightings" of the "messiah" were never as prominent in the past thirty-seven years as they have been in the last thirty-seven months. Not even during the most hail-the-conquering-hero days of Brian Tobin. Not even during the most nationalist-jingoist-where-I-stand nonsense that was Brian Peckford, before he discovered "our" taste for cucumbers. Not even during the most triumphal by-the-short-hairs Meech episode under Clyde Wells. And here, in November 2007, Danny Williams is easily poised to displace Joey Smallwood, if he hasn't already, as the most corrosive political cult of personality that the province has ever seen. Therefore, over the next number of months, I’m going to write about my interlude in that artificial capital, away from real life, during a period that corresponded with the dramatic buildup, climax and conclusion of the Atlantic Accord negotiations between Premier Danny Williams and Prime Minister Paul Martin and their assorted minions. I’ll be attempting, no punches pulled, to provide insights for the future into the kinds of persons, attitudes and actions that helped or hindered our little province in its dealings with a powerful and largely uncaring Ottawa. Should be a real page-turner. First of all, if we were going to convene the legislature right away after the election, we have to wait until members are certified as been [sic] elected; that can’t happen legally until the 25th of October. Then the House has to be sworn in, cabinet has to be sworn in, we can’t start the House after an election without a Throne Speech, so we’d have to have a Throne Speech prepared, so by the time you get all that done logistically, you’re well into November, perhaps getting up towards the end of November. So if you look at it from that perspective, it’s a difficult time with new ministers and new members and so on coming on. “Well into November”, “towards the end of November”. Terrible, awful times to conduct the affairs of state. Right? Well, on this point, Rideout may not be backuppable. In 2004, the fall sitting of the Bow-Wow Parliament started on November 22nd. In 2005, it began on November 21st. In 2006, on November 20th. The same thing happened in 2003. There’s just not enough time to get your new cabinet, get ‘em all up to speed, have a Throne Speech and a legislative agenda ready. “The same thing” happened in 2003, David, because, as you may recall, the incumbent government was defeated. In the interim, the fixed-election date – sorry, fixed election-date – bill was introduced into the House of Assembly on November 29, 2004, receiving Royal Assent less than three weeks later. Everyone, Danny Williams and David Cochrane included, knew when the 2007 election would be held, and knew it for the past three years. The sorry state of democratic institutions in Dannystan. The sorry excuses that Our Dear Premier – scratch that, as per usual, as a potentially controversial piece of news he got one of Our Dear Ministers to announce and defend it – used to justify the delayed opening. Or that there are journalists who are willing to swallow The Party line, hook, line, and sinker, over, and over, and over, and over, and over, and over, and over, and over again. He "bristles" at time wasted in the House. The institution he was elected to, three times now. The institution that is constitutionally required to sit once a year. The institution to which he and his government are, under the Westminster model, responsible — whence, Danny, the "Responsible", in the "Responsible Government as it existed prior to 1934" option that you not-so-secretly wish had won in 1948. But now that there are no more constituency-allowance cheques to hand out, what is that "real work of governing" that is keeping Our Dear Open and Accountable Government from being, y'know, open and accountable? When Len Simms was appointed chairperson and chief executive officer of Newfoundland and Labrador Housing Corporation in 2005, the announcement neglected to mention the fact that Mr. Simms’ term would expire just in time for him to rejoin the PC party campaign team. And, curiously, even though “the premier's office said Simms's contract had expired,” neither said Premier’s office, nor NLHC itself, bothered to go on the record about it. The appointment, we are informed, is effective immediately. The end-date of the appointment, once again, is not given. He [Simms] was appointed Chairperson and Chief Executive Officer of the Newfoundland and Labrador Housing Corporation in February, 2005. In accordance with Provincial Government policy, he resigned from that position on September 10 to participate in the recent provincial election campaign. So here’s a good question for the open and accountable government’s PR flack (hi, Liz!) whose name is attached to today’s press release: when does Len Simms’ contract expire this time? And why did he resign from that position on September 10, when, according to the CBC report of September 12, “the premier's office said Simms's contract had expired”? For reference, the next election, per the “fixed election” amendment of 2004, will be held on Tuesday, October 11, 2011. So... where does this, and the new rules, leave the Williams Family Foundation? Left: Our Dear Party's Our Dear 2007 Election Platform. Right: As Our Dear, Childish, Premier would say, "Steve's" Speech from the Throne. My, but Professor Michael Temelini sounds an awful lot like Our Dear Premier's, and Jack Layton's, talking points. "It's not political correctness. It's just not a term most Newfoundlanders find pleasant to hear.'' — Bill Rowe, on the N-word, in today's Ottawa Citizen. Harper's attempts to "control the news media"? Bad, says Myles at freenewfoundlandlabrador. One of the most important actions of any successful dictatorship is to control the masses. The easiest and best way to accomplish that task is to control the news media. Why did Saddam Hussein plaster giant pictures of himself around Iraq? Why did Hitler* hold mass public cult like rallies with hundreds of thousands in attendance? Perhaps, for example, if you were leading the Canadian government you could simply refuse to talk to certain “unfriendly” reporters and, by using them as an example, force the rest to fall in line. It doesn't always take a political upheaval to turn a democracy into a dictatorship, sometimes all that's required are a series of small baby steps. Funny: does anyone recall Myles Higgin's outrage at Danny's efforts, and those of his minions, shills, and intermediaries, to create his own cult of personality? Has Myles Higgins ever waxed — well, eloquent is not the word — has he ever just plain waxed about Danny Williams Administration NewfoundlandLabrador's use or withholding of government advertising to reward or punish media outlets, depending? Where was Myles when Danny refused to speak to Ryan Cleary and the Independent, or certain, insufficiently pliable journalists at one of the provincial daily papers? Or after Craig Westcott revealed his disturbing account of events on the Telegram's website? Where has Myles been as VOCM, and, to a lesser degree, even the CBC phone-in shows and viewer response lines, have been turned into well-orchestrated two-hour hates against whatever Danny hates, or into well-scripted — literally, scripted — pro-Danny love-ins? It's bad enough that Danny the Projector condemns in others the type of behaviour he engages in himself. It's even worse that the Dannyfans are now doing the same. * And ooooh lookie! A Hitler reference! Isn't that bad when others, especially those nefarious Liberals, do it? It's not that they are so different. It's that they're so much the same. But hand Stephen Harper lemons and he'll order someone to make him lemonade — which he'll then shove aside, grunting, "I asked for iced tea, dammit." The Prime Minister managed to find a bright side to the supersized surplus — it was proof positive of how, by being exactly the same as the Liberals, he is completely different from the Liberals. That may sound contradictory, but not in Harper's world. And really — wouldn't it be great to live in Stephen Harper's world? It is a world where yours is the only voice; a world defined by a strict ethical code that, happily, applies only to others; a world where hypocrisy is rank and detestable — except for your own hypocrisy, which is very pretty and smells like spearmint. Also in Stephen Harper's world: donuts have, like, three calories and Abba never broke up. Truly, it is a paradise. And there, mutatis mutandis, you have Danny Williams as well. I think getting Danny Williams back in is the best thing since Joey. I would love to see the province do a 360-degree turn. It would be nice to see us Newfoundlanders have to go back to fill the employment positions, and for those remaining to be employed.I have a lot of faith in that man and what he is about to do to our province. Honesty is what he is all about. All of us who had to move to the west to work, hopefully we can go back home to settle. Good luck, Danny, and we all know out here in Alberta that you are what the province needs. Feeds Danny's messiah complex? Check. Confirms that the collective search for a saviour is alive and well? Check. Desperate hopes regarding outmigration? Check. Inherently Virtuous Newfoundland Syndrome (of course it will be returning expatriate Chosen, and not The Unworthy Others, filling any future jobs...)? Check. Reference back to Joey? Check. But that's not why the letter is so funny. No, the letter is funny because, in inadvertantly borrowing a metaphor from a certain provincial cabinet minister, its author is, geometrically speaking, hoping for the province to continue on exactly the same course as it is now. "360 degrees." Think, Sonia! Think! Our strategy for rural Newfoundland and Labrador is good schools, good hospitals, good roads, good broadband, good communication links, so that if you or someone else wants to go in and establish a business or bring your family there that you've got all the basics you need to communicate and inter-react with the rest of the world and keep your family safe. Just as long as, at least in Labrador, someone else pays for those schools, roads, and broadband. Autonomy! one federal cost-sharing agreement at a time. Labrador is an integral part of the province. Pick me, voters, I'm ever so modest! Pick me, voters, I'm ever so Irish! I'm buoyed up by Ireland. The wrongs of the past motivate me, I don't think we've gotten a fair shake in the eyes of the nation, I think we've got a lot to offer. So far, y'know, I take criticism well, if it's good criticism. I've been around politics long enough to know that there's a point of diminishing returns, sometimes where you even start to believe your own nonsense, for want of a better term. I am not threatened by people that are brighter, or more competent, or more experienced. Perhaps Professor Temelini, who has drunk remarkably deep from the cup of Really Wierd Newfoundland Nationalist Jingoist-Chauvinism, even by non-CFA standards, can explain what it is that constitutes a “complete and functioning society”, how Newfoundland was complete and functioning, and how everyone else, presumably, was incomplete and malfunctioning. Danny Williams' main failing, one from which most of the others derive, is that he casts aspersions onto others that they have bad intentions or character flaws which, whether they possess them or not, Williams himself possesses. In simple terms: he projects. “negative”, “non-constructive”, “mudslinging”, engaged in “innuendo” and “personal attacks”. “It hasn’t been the pattern or the policy of this government to punish districts. I saw too much of that during the years when I wasn’t in politics and just standing back as an observer,” he offered. Remember the Labradore dictum: NOT(X) = X. When Danny says, “This is not the way we operate. There’s not a question of any district paying at all for not being a government seat... It hasn’t been the pattern or the policy of this government to punish districts,” it is almost worth taking to the bank that it IS the way “we” operate, it is the way districts “pay”, and it has been the pattern of the government to “punish”. Danny encountered what the NTV reporter described as "one dissenter who accused the Premier of favouring Tory districts road reporters"
DISSENTER: — in your own districts. WILLIAMS: — there's nothing further from the truth. DISSENTER: — see the tops of the tall trees. DISSENTER: Good luck to ya', you're a bigger bluff than Santy Claus. WILLIAMS: And he wears red, too! WILLIAMS SUPPORTERS: Right on, Danny! Right on, Danny! Hmmm... I wonder, is there any truth to the man’s accusation that the Premier favours government districts in road funding? And “Eddiot”? Whatever became of the Premier’s deeply-held concerns about “negative, non-constructive, mudslinging, innuendo, personal attacks”. In that one clip, Our Dear Premier blatantly lied — denying, with seven no’s, the easily factually-rebuttable accusation of partisan favouritism — and engaged in exactly the type of behaviour that he supposedly disparages when it is engaged in by others, towards himself. It is disgraceful enough that Our Dear Premier engages in such lies and hypocrisy. It is far more disgraceful that no faces for TV, no voices for radio, and no ink-stained wretches ever seem to call the lying hypocrite out on it. Not even in the middle, or at the tail end, of an election campaign. And to think that in the early days of his government back in 2003, we fairly gushed over the prospects of Danny Williams transforming Newfoundland and Labrador into a "have" province. Back then, though, he was pledging to wean his province off dependence on federal welfare. Instead, Mr. Williams has chosen bombast and continued addiction to Ottawa's handouts. While his militant schtick has proven wildly popular in Newfoundland — he won re-election on Tuesday with nearly 70% of the total vote — it will prove toxic to his province in the long run. Almost from the start, Mr. Williams showed himself to be a tub-thumping populist from the Huey Long school. He stormed out of a first minsters' meeting on equalization when then-prime minister Paul Martin dared suggest equalization to have-not provinces should begin to go down once they've reached "have" status. Later, Mr. Williams ordered all Canadian flags pulled down from above Newfoundland's provincial buildings. After Stephen Harper and his Conservatives took over in 2006, Mr. Williams ran national newspaper ads against the federal government, urging people to vote "ABC" -- Anybody but Conservatives. The Premier also likes to talk tough with the oil companies looking to develop his province's Hibernia South and Hebron offshore oil fields. This, too, has proven itself popular with voters but has cost the provincial economy hundreds of millions -- if not billions --of dollars. Thanks to Mr. Williams' demands for "superroyalties" from the oil companies, the Hibernia field has been shelved for the foreseeable future and the Hebron field will now go ahead only because Mr. Williams swallowed his pride and made major concessions. Like all demagogues, Mr. Williams is fond of the pronoun "I" -- as in I won the deal with the oil companies through my personal "determination and strength of conviction." If " I've accomplished anything here, I just think it's that: Pride in Newfoundland and Labrador." Only I can back down Stephen Harper. His victory speech on Tuesday evening barely acknowledged that he had a caucus and party around him. Meanwhile, while Mr. Williams was huffing and puffing his way to victory, Nova Scotia Premier Rodney MacDonald was quietly negotiating a settlement in the Ottawa-Atlantic equalization skirmish. Under terms of his deal with the Harper government, Nova Scotia may accept the new equalization formula offered in last spring's budget, or it may opt for the old formula any time it feels the new one is shortchanging the province. The same deal is open to Mr. Williams, but he has painted himself into such a rhetorical corner to win re-election, it's hard to see how he could agree -- even though it is a better deal for his province than the one it currently has. Mr. Williams is a character. Of that there is no doubt. But his outsized ego and inflammatory stunts are hurting the people who voted him into office. 1) The comments about Danny's toxicity and hurting the people who voted him into office? Right on the money, and, some years hence, will be read as some of the most prescient things ever written about Our Dear Premier. You may not see it yet — but you will. 3) And, if the National Post had so much as a stringer in Dannystan, or had bothered to fly, drive, or boat someone in for the election campaign, it would know that Our Dear Premier's favourite pronoun isn't "I", it's the Royal "We". Otherwise, boy, it's gonna be fun to hear Our Dear Ex-Ambassador frothing at the mouth this afternoon. 4) You can only storm out of a meeting if you storm into it in the first place. Last night's provisional election results, beautifully mapped. Percentages are the winning candidate's share of the provisional popular vote. "So what's going to happen is that industries are going to look more to Newfoundland than Labrador to set up because there's not going to be no grid or anything for industry to set up to get cheap power," resident William Burden said. Government officials have said that some ideas proposed for Labrador — such as diverting power from a planned transmission line to the island to the Labrador coast as well — are too expensive. But Williams tried to ease concerns. "When it comes to this new power, I can tell you categorically that that industry is going to be here in Labrador," Williams said. Williams promised to continue an energy rebate program to those in isolated communities and hinted at further rebates for residential and commercial customers. As for transmission to the south and north coasts of Labrador, Williams said "the enormous associated costs" make it unfeasible. "Committing to that would be tantamount to telling you that your electricity bills will go through the roof," he said. Williams called Labrador one of his top priorities and said the region's day has come. "I want to make sure I allay any of your concerns," Williams told the gathering before beginning his prepared remarks. "I'd never want the people of Labrador to ever second-guess what our motives are here." He said if there are projects that need electricity in Labrador, they will get it. He referred to the Northern Strategic Plan for Labrador and the recently released energy plan as "evolving documents" that will be adapted over time as the need arises. Hickey arrived at his campaign office to a raucous crowd eagerly awaiting the results from the last Labrador district to have its MHA declared - Torngat Mountains. But moments into Hickey's victory speech, Patty Pottle was declared the winner. Over in Labrador West, PC incumbent Jim Baker also retained his seat. "I'm absolutely delighted," Hickey said. "Three voices for Labrador now, that's great, that's fantastic!" Didn't there used to be four seats in Labrador? Our Dear Ex-Ambassador must be one of those nationalist Newfoundlanders who hasn’t read the Globe and Mail since Charles Lynch had those nasty things to say during the Meech Lake debate. Never mind, of course, that Charles Lynch wrote for the Ottawa Citizen and the Southams. Caller Norm: You know what the Globe is like, they’re trash on Newfoundland. Too often, Danny Williams has heeded the advice of a beloved provincial folk song - to rant and to roar like a true Newfoundlander - to the detriment of national unity. But the Premier of Newfoundland and Labrador has also eliminated the province's almost-perennial deficit, cut taxes, made peace with the offshore oil industry and embraced a policy of education and innovation in a province that has relied on employment insurance. It is a populist and practical approach to government, and it will likely ensure another majority for his Conservatives in tomorrow's provincial election. Mr. Williams is so popular that he has openly mused about the need for a constructive opposition. "There's no benefit to me winning every seat, to be quite honest with you," he declared last month. Other provincial premiers would kill for the chance to make such a selfless proclamation. Mr. Williams has a solid record. The province's economic growth rate could be the highest in the nation this year. His government is in the black, with a forecast surplus of $261-million in 2007-08. His most recent budget included the largest tax reduction in provincial history, as well as practical spending on infrastructure, resource development and skills training. The former entrepreneur has worked hard to broaden the province's business base, including its tourism industry. This summer, after months of very public squabbling, he signed a memorandum of understanding with the oil industry to develop the Hebron-Ben Nevis field. Perhaps most important, he has subtly changed Newfoundlanders' traditional image of themselves. Although he fosters the trite notion that Newfoundland is a victim of federal machinations, he has called for self-reliance through knowledge and skills on the campaign trail. His education platform includes improvements in the mathematics curriculum and more debt relief for postsecondary students. In contrast, Liberal Party Leader Gerry Reid has an earnest platform that devotes more time to proposals to share the wealth than to ways of producing it. The former teacher has tried to exploit resentment in poorer Labrador and in rural areas, where the population is declining as young people leave in search of jobs. In today's Newfoundland, it is an oddly anachronistic appeal. Mr. Williams has huge faults. Upset over changes to the federal formula for transfer payments, he is waging a single-minded war against his fellow Conservative, Prime Minister Stephen Harper. His election blueprint even denounced Mr. Harper as an opponent of Newfoundland's struggle for fairness within Confederation. That is ridiculous. After transfers, Newfoundland has the second-highest fiscal capacity in the nation this year. Its per-capita program expenditures were the highest in Canada in 2005-06. Mr. Williams's over-the-top rhetoric has strained the generosity and patience of hard-pressed taxpayers in other provinces, and unnecessarily damaged Newfoundland's relations with other provinces and Ottawa. Still, he has been a savvy and conscientious premier, opening doors to a better life for his voters. He deserves a second term. Value of mineral production in 2005: New Brunswick, $935-million. Newfoundland and Labrador, $1.56-billion. UPDATE: Hey David Cochrane! Not every margin shrank, but, hey, don't let the facts get in the way of a good narrative. 3. John Lake from St. Phillips, Newfoundland writes: For only the third time in my 35 years as a voter I voted Progressive Coservative. It wasn't so much for the party because i know nothing about my local candidate. It was a vote for Danny Williams. It was a vote for Newfoundland. Danny Williams is a Newfoundlander. He refers to Newfoundlanders as a race. He believes Newfoundland is a distinct and unique society. Heard that phrase before, have you? Not since Cheslie Crosbie has there been someone with the political will to protect Newfoundland interests above all others. Someone who is not overwhelmed by partisan politics and is willing to take on all adversaries regardless of their political stripe. When was the last time a premier of this province was willing to challenge a Canadian Prime Minister of the same political party? We have too long been lambs to the slaughter. About time we had a lion to protect the flock. "Tonight's victory is not just a Progressive Conservative victory," Williams told a cheering crowd of supporters at the Fairmont Newfoundland hotel Tuesday night. "In fact, it isn't a Progressive Conservative victory. It's a victory for Newfoundland and Labrador." 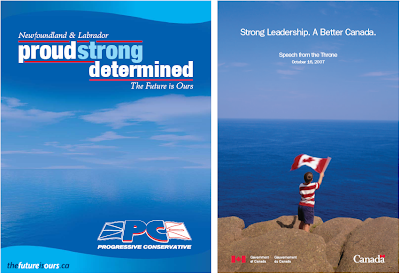 Is there no one else who finds this concatenation of the interests of the Progressive Conservative party, and those of Newfoundland and Labrador, to be, frankly, well, frankly, just a little disturbing? I look forward that after this election, sitting down with the Combined Councils of Labrador and all of the voices of Labrador, Bill, because there are many, many ways to look at this energy plan... This was a high level plan that was put out by the province. Bill, we've got, going to be, there's going to be two more elections, Bill. There's going to be two more opportunities for the people of Labrador to vote on what this government does on a go forward basis with the Lower Churchill. We ain't seeing no power coming out of there before 2015, at the earliest. Meeker rocks, even if he should have blogged this weeks ago. That Crime Stoppers PSA praising up the government's enforcement efforts sure is in heavy rotation today. But he never said they would never take them away. When she’s sitting around the table she can do a lot for the district… she can meet the Minister one on one instead of writing letters. So… opposition members are not allowed to meet Ministers? Doesn’t Danny find that annoying? All these Tory talking-point callers, calling in on much the same theme. You would almost think it was co-ordinated or something. Oh, and “voting with honesty”? Genius! Pure genius! “It’s good to have an opposition, but it’s important that that opposition be a constructive opposition, it not be a name-calling, mudslinging, personal- attacking type of opposition,” Mr. Postivity said at the start of the campaign. “Go ahead and mark an ‘X’ for the idiot,” Mr. Positivity is said to have advised an Eddie Joyce supporter in the Bay of Islands on the last day of the campaign. It’s going to be a little harder to refuse that [fish processing] license if you’re on Mr. Williams’ side of the fence. – VOCM caller and PC supporter from Burgeo “Alistair”, just now. "People realize that we have to be on the government side in the next four years. Otherwise, we're going to pay dearly for it... People are telling me. 'We've got to be on Danny's team. '...If we elect [Yvonne Jones], we're electing a person who will serve in opposition, and if we do that I guess we're going to be the sacrificial district..."
Tory candidates who try to browbeat voters by saying they will be punished if they don't elect a government MHA can expect a terse phone call from Premier Danny Williams. "I won't stand for those kinds of statements being made by any candidates on our behalf in this election," Williams said Wednesday. Williams said he contacted Normore Wednesday morning to "express my displeasure" about the "improper" comments. "This is not the way we operate. There's not a question of any district paying at all for not being a government seat," Williams said, adding that he was "very annoyed." "It hasn't been the pattern or the policy of this government to punish districts. I saw too much of that during the years when I wasn't in politics and just standing back as an observer," he offered. Dennis Normore apologized Thursday for stating that the district of Cartwright-L'Anse au Clair would "pay dearly" if voters do not elect a Progressive Conservative in the Oct. 9 provincial election. Acting on the advice of Premier Danny Williams, Normore said his comments in a Tuesday article in The Telegram were a mistake and are not reflective of the way the Tory party governs the province. He attributed his comments to his inexperience as a politician*, his eagerness to defeat Liberal incumbent Yvonne Jones, and his strong commitment to the district. "It was a mistake on my part to be so strong with my words. I probably, and I will, apologize," stated Normore. What Dennis said at that time is right. If we put the wrong canidate [sic] in I will cry for the people who have to choose from food or medication because money is tight. cry for our elderly who live on a fix [sic] income and prices a high and they do without. people who need help with housing and are on long wating list. Are Bolger and Hedley speaking for the Normore campaign? Are their statement condoned by the campaign central? Is it OK for Danny's Minions to engage, openly, notoriously, publicly, and repeatedly, in the same kind of Smallwoodian politicking that Danny himself supposedly is "very annoyed" about? Is it OK for Minions to do, openly, notoriously, publicly, and repeatedly, what candidates get their noses rubbed in? * Normore is a second-time provincial candidate. It's not often that you get to do a really good empirical check on a pollster's numbers outside of a general election. 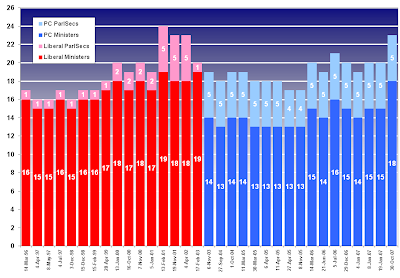 But last winter's series of by-elections provided just that. Set and publish content rules for government advertising that will stop the use of public funds for political advertising. Where are those content rules? The lopsided contest has made Tuesday's vote here essentially a foregone conclusion. The most recent polling numbers available are from August, and they show Mr. Williams and his party enjoying support in the range of 75 per cent. The poll was taken before Mr. Williams announced a memorandum of understanding with an oil consortium, noted Corporate Research Associates president Don Mills, whose company did the polling. “We can only imagine what it'd be now,” he said. dozens and dozens of people who are saying that either they’re back, or their families are coming back, or their families are about to come back. There seems to be a change in attitude, and I think, you know, that Hebron made a difference. It was kind of a reversal of what, I guess, Newfoundlanders and Labradorians felt was a negative trend that they had to go outside the province to work. But now I think they are feeling very good about the province, they see hope, they see security. You know: reality check. The sort of thing the media used to do in the good old days. Like in 2006. According to the latest statistics, the working-age population of Newfoundland and Labrador declined by 3900 people between September 2006 and September 2007. The labour force declined by 2900. The number of people employed (full- or part-time) declined by 1400. The decrease in the September to September unemployment rate is due to the larger, and continuing, decrease in the labour force. That Mr. Positivity. He’s so positive, and never, never, ever engages in name-calling, mudslinging or personal attacks. "Increased funding" implies that Crime Stoppers already receives provincial government funding. And, sure enough, a provincial government department is listed as one of the organization's sponsors. The salmon and trout stocks in NewfoundlandLabrador are very important to the future of NewfoundlandLabrador and its people... That's why government has increased its number of enforcement officers. If you see suspicious activities on the province's rivers, brooks and streams that threaten the valuable salmon and trout stocks, call CrimeStoppers... Help the Government of NewfoundlandLabrador, as well as the enforcement officers, in protecting the province. "We have a zero tolerance policy when it comes to organized poaching in the province. We will also continue to lobby the federal government to provide additional resources for the protection of inland fisheries," said the minister. "It is quite evident that the program is working very effectively and is making significant progress in targeting poaching and protecting the overall health of our salmon and trout populations... Through this program, this government continues to clearly demonstrate its concern for this valuable resource and we will continue efforts to see additional enforcement resources directed toward the protection of inland fish." And for the love of decency: governments don't "lobby"! So... has anyone seen the report on the Trans-Labrador Highway chip-seal pilot project yet, in hard copy or on the internets? Another interesting point emerged from Our Dear Premier’s unannounced (why not?) campaign stop in Cartwright-L’anse au Clair on Monday night. The Premier came in last night to L’anse au Clair to a rally and he spoke about the energy plan and he stated that if you turn on your lights and you got cheap power, it doesn’! t matter where it comes from and where the lines go, and he’s committed to this, that we will have cheap rates and that.. He said if you turn on your lights and you have cheap hydro, it doesn’t matter where it goes and so long as we get cheap rates it doesn’t matter, not to me anyway. Apparently lights and toasters operate on entirely different physical principles in Newfoundland than they do in Labrador, because fossil-fuel electrical generation, however it is underwritten, seems to matter, a great deal, to the light bulbs and kitchen appliances of the island. Or at least this would seem to be the necessary implication of Our Dear Premier’s argument as to why coastal Labrador doesn’t really need no stinkin’ power line. Perhaps it wasn’t. But none of the chase-plane reporters bothered to ask. One thing that I’ve stood for since we’ve been in government, first of all, no more giveaways, we’re not going to allow major companies to come in here, and give it all to them, let them take all the money out, and leave nothing for the people. So hopefully if we get development done properly, there’ll be enough infrastructure, you know, buildings like this wonderful school that you got here, and other things, and roads will get done hopefully, you know your power situation will be even improved, so they leave a lot of good things behind them, and they’ll provide, hopefully, an opportunity for people to get employment, and the royalties that we get, we’ll be able to push back in. “We” aren’t “going to allow major companies” to “take all the money out”. No, according to Our Dear Energy plan, that’s the exclusive right of the provincial government. Badump-chink! But seriously, what difference does it make to the resource-producing region in question if the money-taker is a major company, or a major crown corporation, that takes everybody’s money and never give it back? Who will do the doing and improving, Danny? Who is the agent of those passive verbs? And interesting, because O.D.P. says that “the royalties that we get, we’ll be able to push back in”. It’s a little vague, but let’s assume – a journalist, if any were on the chase plane, should have asked – that he means the uranium royalties, and that they’d be “pushed back in” to northern Labrador. Natural Resources Minister Ed Byrne said the government would do no such thing. He said while the province is committed to improving infrastructure in Labrador, it will not set up special funds earmarked for any part of the province, whether it be Labrador, the Burin pensinsula or any other region. “I don’t want to get into a situation, and I don’t think government wants to get into a situation – and Ms. Jones, when she was a member of a provincial cabinet not so long ago, didn’t want to get herself into a situation – where they earmark funds for particular places in the province,” says Byrne. Is Danny making things up as he goes along, again? Those who are pushing the line that Danny Williams will put Patty Pottle in cabinet give some serious thought to whether he will put her in cabinet with very, very, very, very serious consideration, should give their heads a shake. And the media really ought to consult their backfiles and do a little reality-check. You know: reality check. The sort of thing the media used to do in the good old days. Like in 2006. A Tory candidate in Labrador is a "redneck" with a racist history whose potential elevation to cabinet in a Danny Williams administration would turn back the clock on aboriginal relations in the province, Innu Nation President Peter Penashue charges. But Penashue could not give a specific example in which John Hickey acted in a racist manner. And Hickey, who is running for the Progressive Conservatives in Lake Melville, strongly denied the allegations, calling them unfortunate and made in the heat of an election campaign. "I see no need to wallow in the mud and give those comments more attention than they deserve," he said. Lake Melville MHA John Hickey — the only Tory MHA from Labrador — was expected to get the Labrador and Aboriginal Affairs post, but that portfolio was divided between Straits and White Bay North MHA Trevor Taylor (Labrador), who is also fisheries minister; and Lewisporte MHA Tom Rideout (aboriginal affairs), who is also minister of works, services and transportation. Brandon Pardy ran for the Labrador Party in the provincial election and told VOCM Open Line many people decided to vote for Hickey because they expected him to be able to represent the region in cabinet. But the Conservatives were quickly criticized for leaving Labrador's sole Conservative representative, John Hickey, out of cabinet. "It's insulting", said Brandon Pardy, who ran for the fledgling Labrador party. The party garnered a large portion of votes in two ridings but failed to capture a seat. Williams defended the move and pointed out that Labrador Affairs Minister Trevor Taylor was born in Labrador. "You can't have it both ways," he said. "If you're going to cut the cabinet back then obviously certain portions of the province, minute portions of the province, can be left out." Do we need someone who can scream and shout, or do we need someone who can work with the government? He says that as if screaming and shouting are bad things. If they are, why would he ever, in a million years, support that supreme screamer and shouter, Mr. Tantrum himself? On Tuesday night, [PC candidate Mike] Eddy sounded a sour note after showing up to concede the contest and congratulate Ms. Kent at her victory party, saying the byelection result means no improvements for the constituency. "All I can say is the community has elected the person they want to be their representative, and if the last nine years are any indication, we deserve what we’ll get in the years ahead," he said. "It means we’ve got nothing for the community in infrastructure in the last nine years, so if that’s any indication, we won’t see much progress in the years ahead." Premier Rodney MacDonald downplayed Mr. Eddy’s comments, though he repeated, as he had through the campaign, that he thought the constituency would be better off with someone in government. "I can assure the people of Cole Harbour-Eastern Passage that I as their premier, and our government, won’t forget about them," Mr. MacDonald said. And the Paul Martin Award for Veryvery goes to..
"I can tell you quite honestly, quite sincerely, she's cabinet material," Williams said. "I'd be very, very proud to have her in cabinet. I don't go around promising cabinet positions to any of my candidates, because I just can't do it. But I can tell you that if she makes it, she's going to have very, very, very, very serious consideration in the cabinet. I think that's very, very important." Cartwright-L'anse au Clair got the stick. "What you need is, you need Patty sitting at this cabinet table with me. That's what you need there. Exactly right," Williams said during a campaign stop in Rigolet. "If you give her to me as a member, then I will give some serious thought to whether I can give her back to you as a cabinet minister, and we will take it from there," Williams told supporters. Vote for Patty, and Danny will think, seriously, about maybe putting her in cabinet. That's almost as solid a committment as the Metis got in the last election! Does this mean he's written off Cartwright-L'anse au Clair, Labrador West and Lake Melville?